Nickelodeon USA is decking the halls with festive programming for little ones this month! Starting Saturday, Dec. 8, at 11 a.m. (ET/PT), preschoolers can unwrap the gift of all-new premieres of hit series PAW Patrol, Butterbean’s Café, Blaze and the Monster Machines, Top Wing and more. 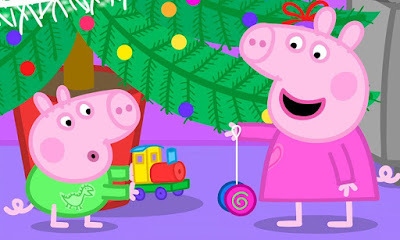 Throughout the month of December, fans can also tune in to the Nick Jr. preschool block on Nickelodeon and the Nick Jr. channel to catch holiday-themed encores of Nella the Princess Knight, Sunny Day, Dora the Explorer, Blue’s Clues, Bubble Guppies, Peppa Pig and Team Umizoomi, among others. 12:00 p.m. – PAW Patrol “Pups Save a Frozen Camp-Out/Pups Save the Fizzy Pickles”: Alex and Mr. Porter are on a tropical island camping trip when a freak snowstorm hits. / Mr. Porter is delivering his famous fizzy pickles to people around town when a bumpy road shakes up the deliveries and causes the pickle jars to pop. 12:00 p.m. – Blaze and the Monster Machines “Snow Day Showdown”: It’s a snowy day in Axle City, and every truck in town is lining up for a delicious winter warm-up — hot chocolate! When Crusher tries to take all the hot chocolate for himself, Blaze is in hot pursuit to get it back. 12:30 p.m. – Top Wing “Top Wing Rescues Survivor Bear/Timmy Wings It”: The Cadets team up to rescue TV adventure star Survivor Bear who comes to Big Swirl to brave Icy Summit. / When Swift hurts his wing, Timmy Turtle has to help pilot the Flash Wing to save the day. 11:00 a.m. – Rusty Rivets “Rusty Saves Christmas”: Rusty, Ruby, and Liam head to the North Pole to fix Santa’s conveyor belt that he uses to load gifts from his workshop into his gigantic toy bag. Frankie stows away to find the present he really wants for Christmas. 3:00 p.m. – Becca’s Bunch “Runaway Acorns”: When Wagtail Woods’ supply of acorns is lost, Becca and her Bunch go on a mission to recover them before a winter storm arrives. 3:00 p.m. – Becca’s Bunch “Merry Woodsmas”: Becca and her Bunch pick Santa as their Secret Santa, but how do you give the best present giver in the world a gift? 3:00 p.m. – Becca’s Bunch “Snowball Rumble”: Becca and her Bunch are finally old enough to compete in the Snowball Rumble and face off against their Cheddarton rivals. 11:00 a.m. – Thomas & Friends “Kangaroo Christmas/Hunt the Car”: Thomas is surprised that it’s summer in Australia over Christmas and helps to reunite a baby kangaroo with its mother. / Bill and Ben’s latest game consists of hiding cars and making other engines hunt for them. After they discover that one of the cars is for the children’s Christmas Party at Ulfstead Castle, they want to give it back but it’s not where they left it. 3:00 p.m. – Cleo & Cuquin “The Big Freeze”: Everyone is having fun ice skating until Cuquin, who can’t skate, discovers how fun it is to knock them down. Everyone gets angry and sore, but Cleo knows how to fix it — they just have to teach Cuquin how to skate! 3:00 p.m. – Cleo & Cuquin “Christmas Day”: Everyone is decorating the house for Christmas, but they soon learn that Cuquin’s present destroyed Santa’s toy factory. Cleo comes up with the solution — they’ll be Santa’s elves and help him with the presents. More Nick: Nickelodeon USA's December 2018 Premiere Highlights | Nickmas | Holidays! Originally published: Sunday, December 2 at 1:09am GMT. Follow NickALive! on Twitter, Tumblr, Google+, via RSS, on Instagram, and/or Facebook for the latest Holidays on Nick Jr. and Nickelodeon Preschool News and Highlights!